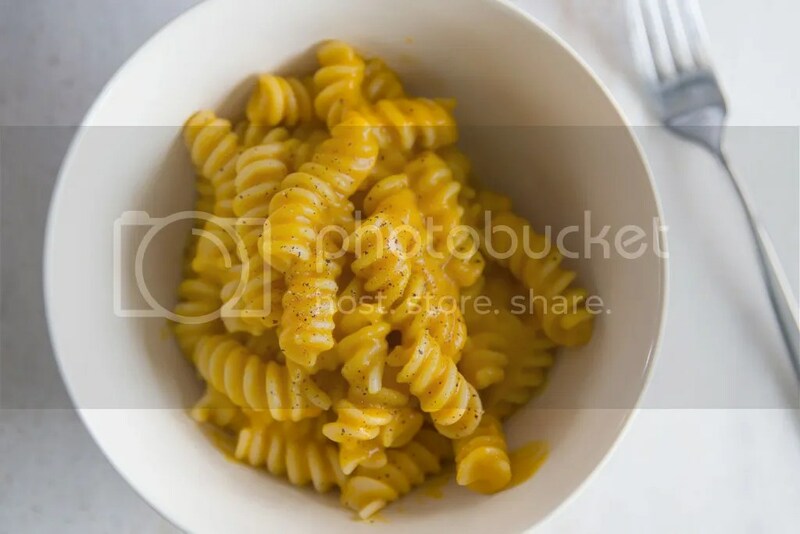 Jump to the Creamy Butternut Squash Pasta Recipe. The next day, my husband was shopping for RVs. 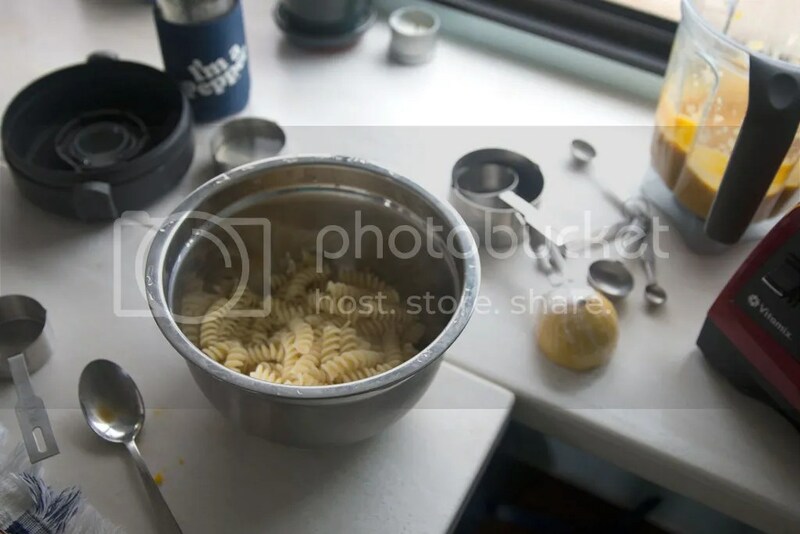 I’ve learned a lot from living in a 150 sq ft trailer, but for now I just want to talk about one small part of it—cooking dinner. Sometimes dinner is very camp-y around here—think: baked beans and potatoes cooked in the campfire. On lazy days, it’s more like a can of Amy’s soup with some white rice…or even takeout if we’re in a city (so far Thai takeout has been the most consistently delicious across the country). On days when I can get it together, pasta with lots of vegetables is our go-to. That leads me to this pasta! Before we dive in, I want to know something: have you ever completely lost your knife to a butternut squash? You know, mid-slice you can’t move the knife any further through the hulking gourd and you can’t get it out either? 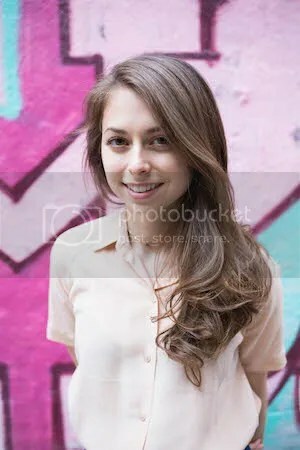 A nothing out/nothing in situation? Or have you ever given up halfway through peeling one of em? And ended up with a few of your knuckles bleeding and the squash rolling around on the floor, leering at you? Then this recipe is for you. 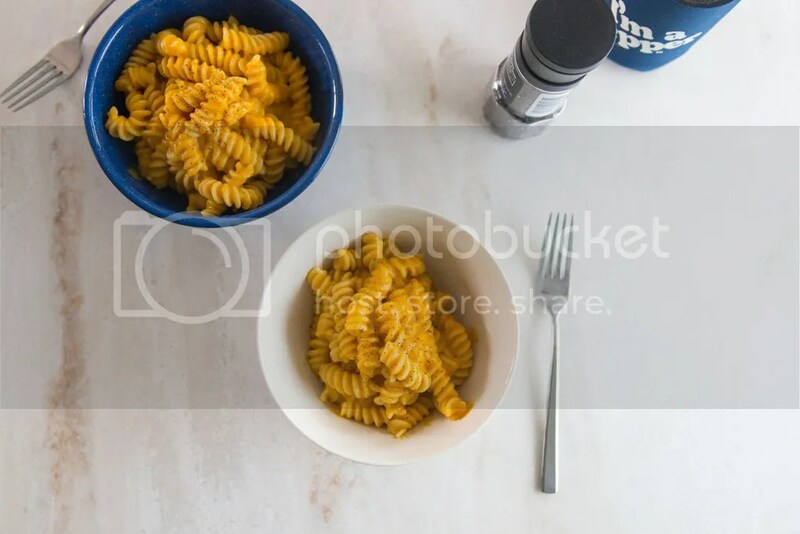 🙂 It’s a recipe for creamy pasta…but it starts with the simplest, easiest way to prepare butternut squash. 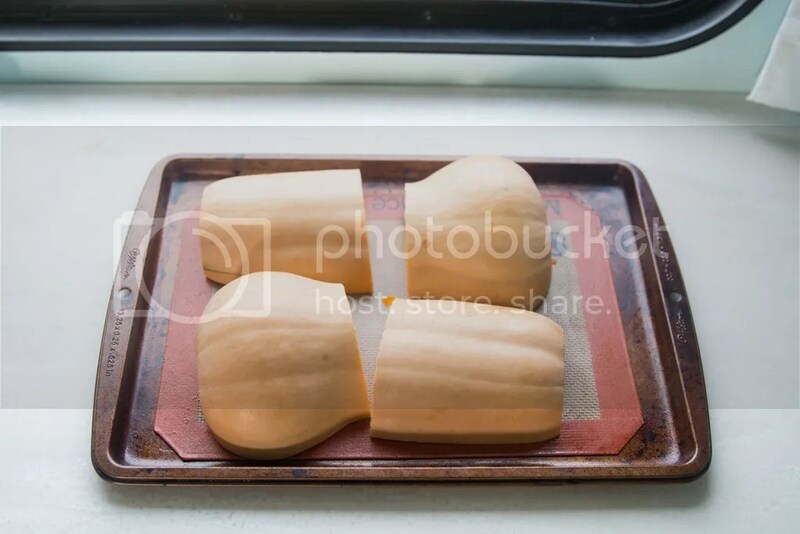 All you do is cut off the stem, then cut it in four pieces, scoop out the seeds, put the squash flesh-side down on a baking sheet and throw those suckers in the oven. If you want to get fancy, you can put a few garlic cloves in the cavities where the seeds were and let garlic permeate the whole thing. (I recommend it.) You don’t have to flip it or stir it or brush it with oil. You just LEAVE it, and once it’s cooked, you scoop the roasty squash out of the skin. You can turn around and make this creamy pasta recipe that I’m sharing here, but you don’t HAVE to. You can stop right there and scoop the squash into rice bowls, mix it into pasta, or purée it into soup. Heck, you can even eat the squash right out of the skins. 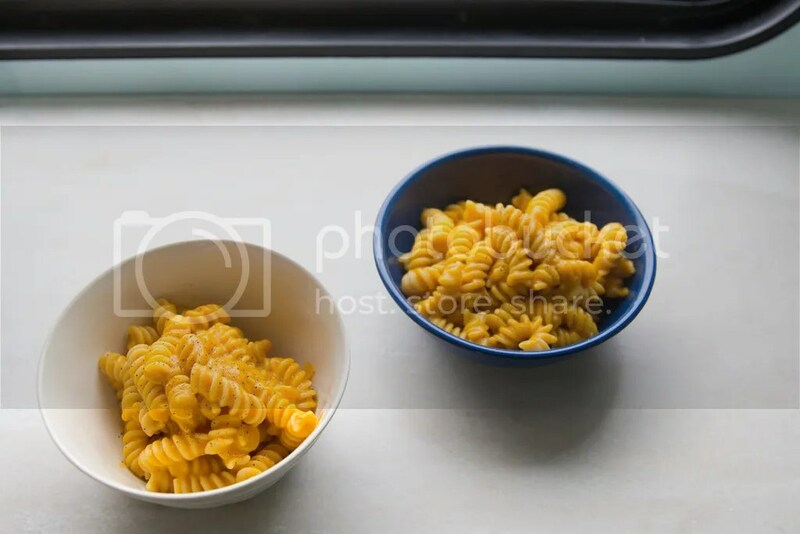 I think one reason he’s not a fan is that butternut squash is kind of sweet potato-y, and also because this pasta LOOKS so much like mac ‘n’ cheese but doesn’t taste like it. 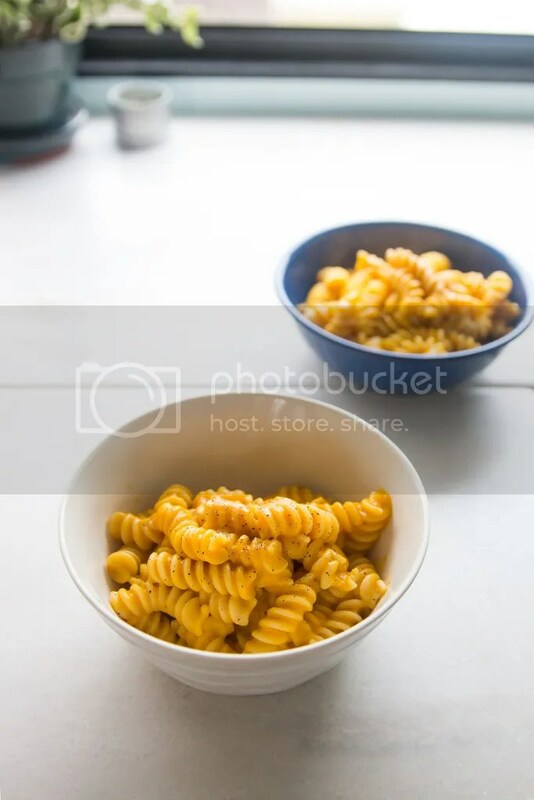 In the vegan world, there are several varieties of vegan “mac ‘n’ cheese”: nut-based sauces are common—usually involving cashews or sunflower seeds—and then there is soy-based sauce involving puréed tofu. 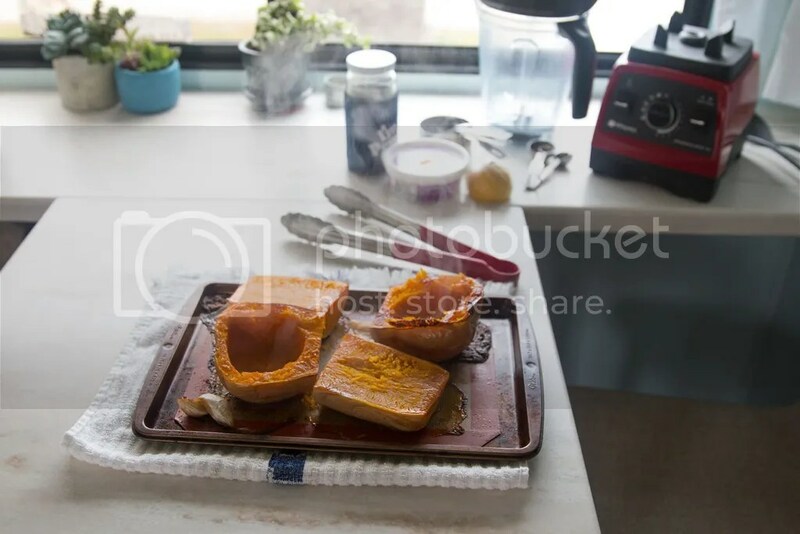 But my favorite variety is this one, which is really just puréed butternut squash with a few things thrown in to give it some extra umami: roasted garlic, miso, and nutritional yeast. And while it requires a high-quality blender, it’s pretty low maintenance as cream sauces go. Plus, you can make a double batch of the sauce and keeping it on hand throughout the week. Just kidding – sprinkles would be super gross. Note: I tested this recipe with a high-powered blender, but I suspect it will also work using an immersion blender or a food processor. Wash the squash. Cut off the stem. Cut the squash in half, just above the bulbous part. Cut the bulb in half and cut the top part in half. Scoop the seeds out of the bulbous part. 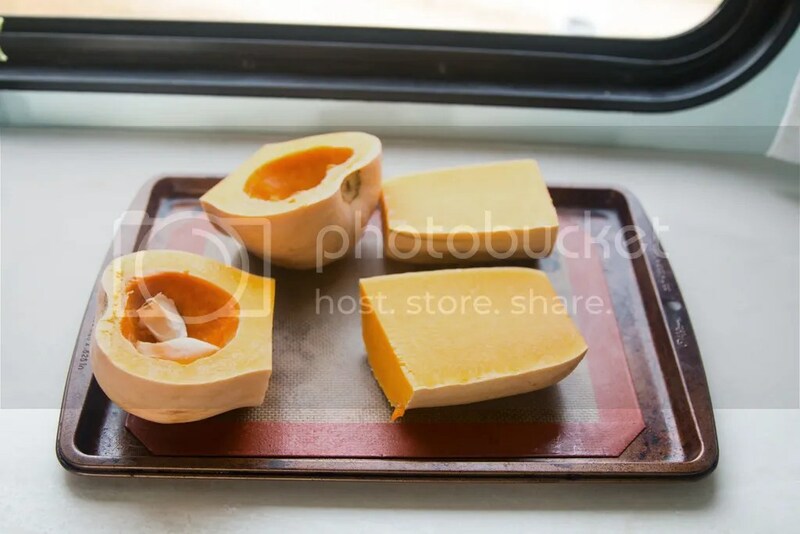 On a cooking tray lined with a silicone baking mat or parchment paper, place the squash cut-side down, with 2 cloves of garlic in each cavity. No need to peel the garlic cloves—they roast better with the skins on. Cook for about 1 hour, until a sharp knife slides in easily and juices are bubbling around the squash. 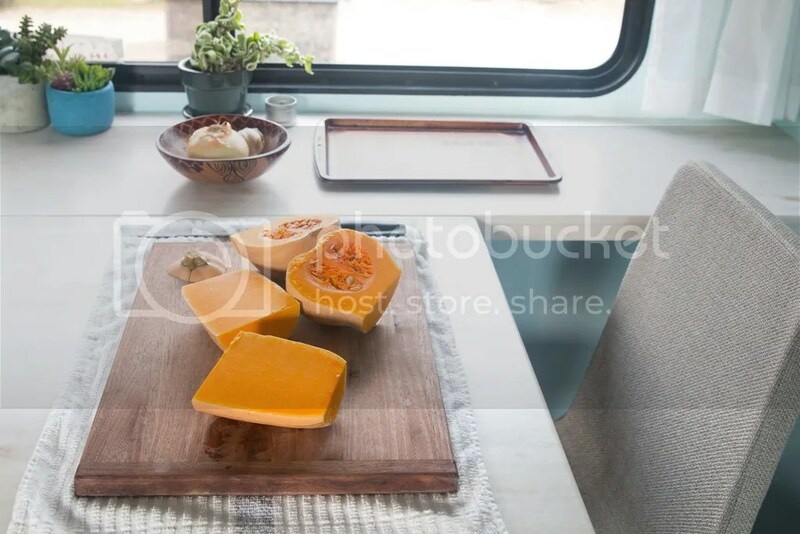 STOP: You can stop here and enjoy the squash as is, tossed into pasta, scooped into rice bowls, or puréed into soup. If making creamy pasta, continue. 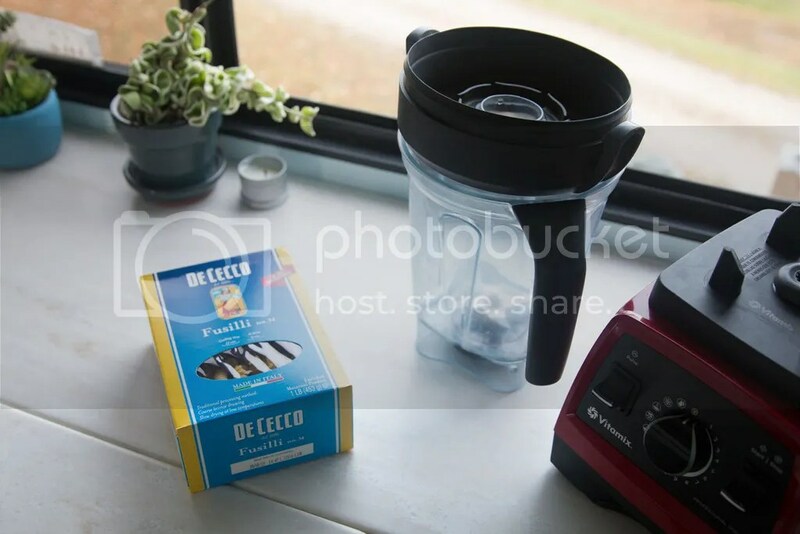 Meanwhile, cook the pasta according to package directions, reserving 1 cup of starchy cooking water. 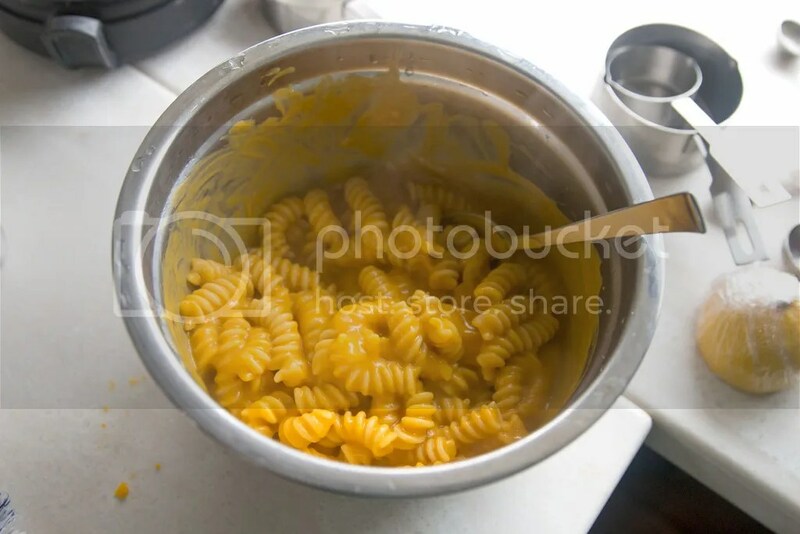 Return cooked pasta to the pot, off the heat. 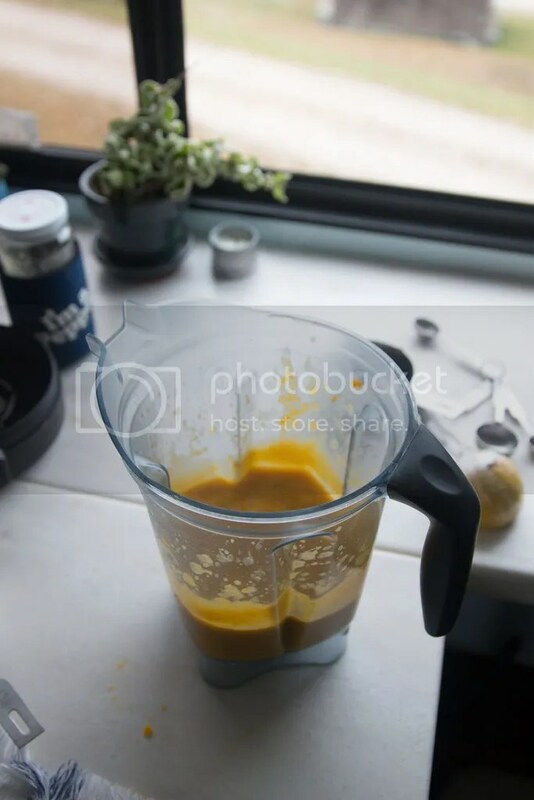 When the squash is ready, scoop out half the flesh (I use one bulbous part and one top part) and add it to a blender (or to a pot if using an immersion blender). It should come out to a scant 2 cups of squash. Squeeze 2 of the roasted garlic cloves out of their skins and into the blender. Back in the pasta pot or a large bowl, stir together the pasta and about half the sauce mixture. Add more to coat the pasta according to your tastes. If the sauce is too thick, add pasta water a little at a time. Serve immediately with cracked pepper, sea salt, and/or a drizzle of olive oil. That’s so good! I recommend tofu or tempeh…I’m going to put up my 4-ingredient tempeh soon and it would be so good with this!! I cannot wait to make this for my daughter! Looks delicious! I hope she likes it, Barbara!